Imagine bringing the truly cinematic quality of 4K into your own home. 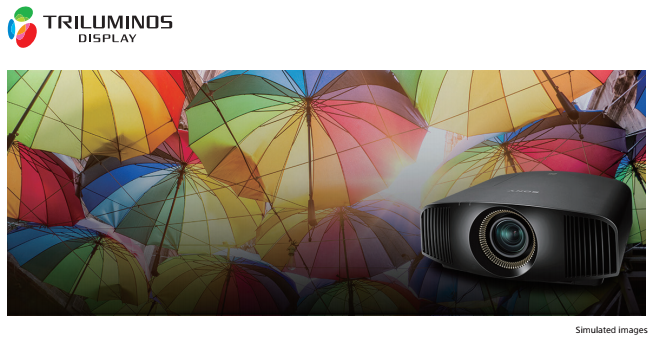 Now you can make this a reality with our VPL-VW550ES/VW360ES/VW260ES series of Home Cinema projectors. They produce true 4K resolution images with our native 4K (4096 x 2160) SXRD panels – that’s over four times the quality of Full HD. Designed for your home cinema room and living room, the VPL-VW550ES/VW360ES/VW260ES deliver stunning, detail-packed images and incredibly lifelike colour like never before. And with high brightness, you’re guaranteed an exceptional picture even in well-lit rooms. 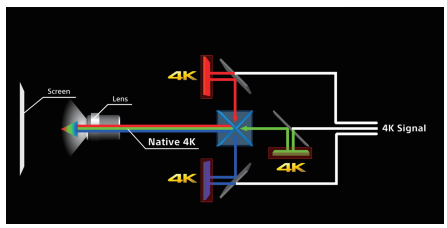 Advanced Sony’s SXRD (Silicon X-tal Reflective Display) panel technology featured in Sony’s digital cinema projectors delivers native 4K (4096 x 2160) resolution images, with more than four times the detail of Full HD. Fine details are wonderfully clear and natural, without jagged edges or visible pixels. Latest SXRD panels deliver even better contrast, as well as native 4K resolution. SXRD projection offers rich, inky blacks, as well as clear cinematic motion and image smoothness. Improvements to the silicon layer now mean even better light control, for precisely delivered shadows and blacks. 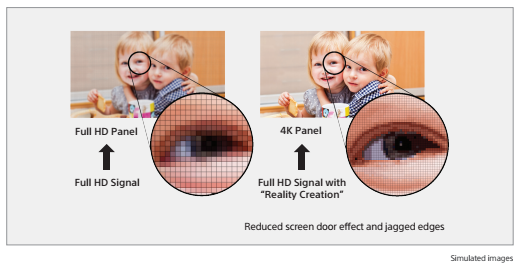 Sony’s SXRD panel can achieve the highest contrast ratio compare to other devices. As a result of high contrast, it gives you the feel of high brightness, and thus more immersiveness. Get the most from your projector when viewing new UHD Blu-ray and streaming services with High Dynamic Range (HDR). HDR video offers a vastly expanded brightness range to deliver far more realistic, high-contrast images and brilliant colours. Compatible with both HDR10 and HLG (Hybrid Log-Gamma) formats. 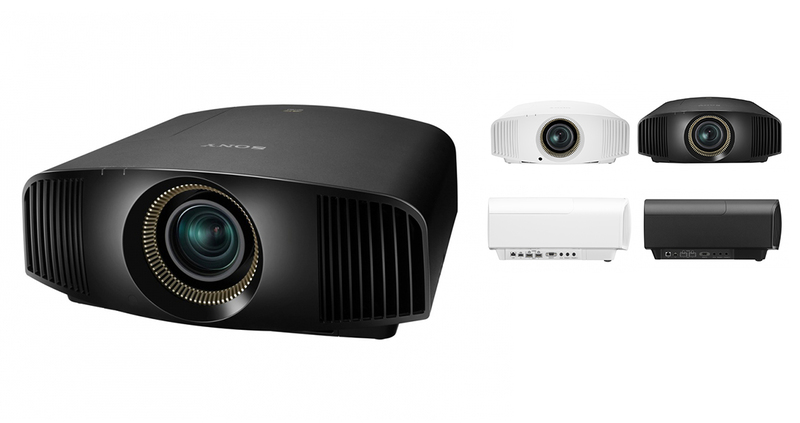 Sony’s home projectors reproduce colour and contrast faithfully to creators’ intentions. Sony’s exclusive Reality Creation technology analyzes images right down to the pixel level. It then employs pattern-matching algorithms developed over years of movie production to enhance crispness even without increasing digital picture noise. It also upscales existing full HD Blu-ray DiscTM and DVD movies to near 4K quality. Discover true-to life colours and tones. The projector’s incorporates TRILUMINOS colour, reproducing more tones and textures than a standard projector system. Hard-to-reproduce crimson reds, aqua blues, and emerald greens are displayed beautifully, so landscapes and seascapes look more vivid. Faces look better, too, with skin tons more faithfully reproduced. 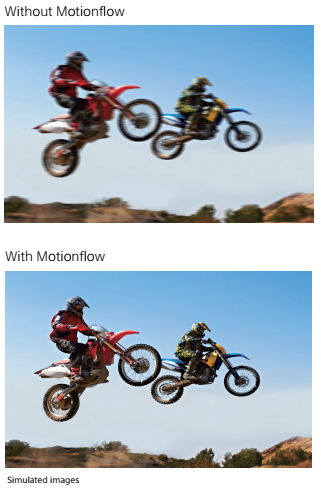 Whatever you’re watching, you’ll enjoy a silky smooth on-screen look in fast-moving action sequences with Motionflow. 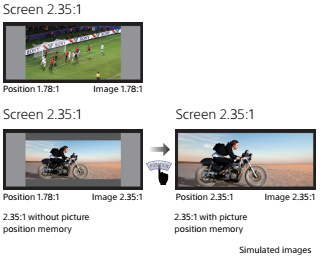 This innovative technology creates and inserts extra frames between the original frames, first comparing key visual factors on successive frames, then calculating the split second of missing action in the sequences. True Cinema 24p mode mimics true movie projection for cinema purists. Achieving such compact size, provides great flexibility for a variety of installation situations. The projector offers a powered lens for zoom, shift and focus operations to provide maximum flexibility for home installations, including high ceiling mounting. Because the fan is positioned at the front, you don’t need to leave a large gap between the back of the projector and the wall for air intake not inhale exhaust when you install. This helps maximize the throw distance for bigger projected images. The projector has a set of memory registers to store the position of the lens (focus, zoom, shift). Users can match a movie’s aspect ratio, including 1.78:1 and 2.35:1, and store these settings in the projector for easy recall. 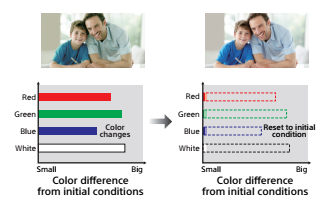 After extended periods, colour can be automatically calibrated to the original factory condition. There’s no need for extra calibration equipment or cameras; a built-in colour sensor stores all the Wider Zoom and Shift Lens necessary information. Both HDMI inputs are compatible with HDCP 2.2 – the latest content protection standard. A built-in RF transmitter synchronizes with most RF 3D glasses for wider coverage and greater stability, and there’s no need for an external transmitter. * Approximate recommended period, in low mode. A new feature for gamers. Experience our fastest ever response time between your controller and the screen for ultimate gaming action. Compatible with many home automation systems via an RJ45(IP), RS-232C, TRIGGER and IR IN interfaces. * They will depend on the environment or how the projectors is used.